Melt butter and chocolate chips in a bowl. Whisk until completely blended. Set aside. In another bowl, beat eggs, sugar and vanilla until well mixed. Add chocolate syrup and mix well. Sift flour and cocoa powder. Slowly incorporate until well mixed. If using a handmixer, use lowest setting. Pour chocolate batter in ramekins to 3/4 full. Bake for 10 minutes. It's best to place ramekins on a baking pan for easy removal from oven. Served by removing from ramekin or eaten off in a ramekin. Just be sure to cool it down so you don't get burned. Recipe and instructions are all from this video. Real simple to follow. In the beginning, the chef is using a complex contraption to melt butter and chocolate together. That's not necessary since you can use a sauce pan directly over a stove. Or just a bowl in a microwave. It's all up to you. 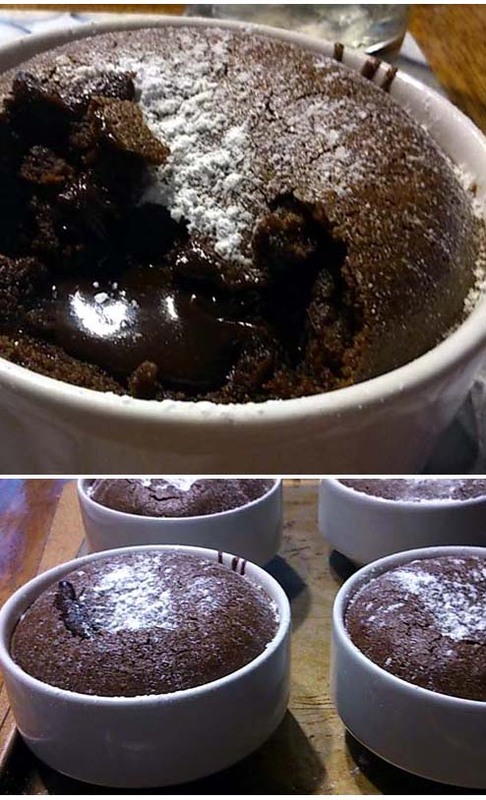 Also, you can serve this lava cake in a mug or in this case, a ramekin.